Properties in Montesquieu-des-Albères average 4.5 out of 5 stars. Villa 4 *, beautiful view, just steps from the sea and Spain. All inclusive. 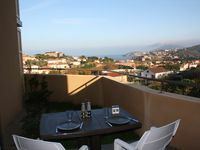 Property 8: Villa 4 *, beautiful view, just steps from the sea and Spain. All inclusive. House between the sea and mountains. Property 11: House between the sea and mountains. Small house not overlooked in the old village of Montesquieu des Albères. Property 20: Small house not overlooked in the old village of Montesquieu des Albères. large villa with pool and beautiful view on the Canigou mountain. Property 26: large villa with pool and beautiful view on the Canigou mountain. Villa with heated pool and large garden. Property 42: Villa with heated pool and large garden. Welcome To Chez Nous (air conditioned bedrooms). Property 44: Welcome To Chez Nous (air conditioned bedrooms). 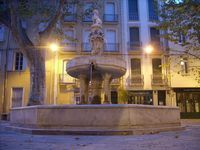 Staying in this charming four-story apartment - in the heart of this sweet little French town - enhanced the wonderful experience we had in Ceret. The winding greenery and lavender shutters on the outside were picture-perfect and standouts on the street. The kitchen was very well-equipped; and the winding stone stairways added to the authenticity. The master bath was large and comfortable, and the fab fourth-floor living room made us want to throw a party. we loved feeling like locals and would highly recommend this beautiful place!